What is Your Snore Score? Is Pillar Right for You? How Bad Was The Problem? What is it Like to Get The Procedure? How Well Did The Procedure Work? Dr. Parker will examine your upper airway to determine if your palate is causing or contributing to your snoring or obstructive sleep apnea (OSA) and if you are a good candidate for the Pillar Procedure. More than 30,000 people worldwide have been treated with the Pillar Procedure. 1. Quinn SJ, Daly N, Ellis PD. Observation of the mechanism of snoring using sleep nasendoscopy. Clin Otolaryngol Allied Sci. 1995 Aug; 20(4): 360-4. 2. 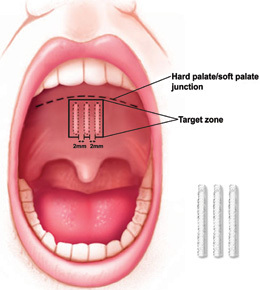 Isono S, Tanaka A, Nishino T. Dynamic interaction between the tongue and soft palate during obstructive apnea in anesthetized patients with sleep-disordered breathing. J Appl Physiol 2003; 95: 2257-64.